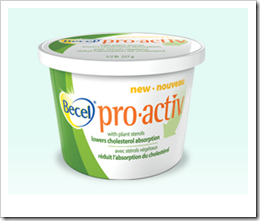 This is a relatively new product out in the margarine market – Becel pro-activ. It’s a calorie-reduced margarine with plant sterols. So for people who are really health conscious, why not take the margarine instead of butter replacement one step further to calorie-reduced margarine with added plant sterols? The big question, however, is how does it taste? I had some test testers try out Becel pro-activ on crackers to see what they thought. Would they switch over from their usual butter/margarine for the added health benefit? Becel pro-activ has less than half the calories of Becel original (30 kcal vs. 70 kcal) with the addition of plant sterols for heart health. However, the tub is a lot smaller and more expensive than the other Becel varieties ($6.59/half a lb vs. $3.79/lb). I think that choosing a calorie-reduced margarine instead of butter or regular margarine is quite a big step. I think that the calorie reduced margarine will taste watery and bland and not worth eating on it’s own. However, I think that if you were to put it in a sandwich or on top of vegetables where other flavours are involved, then it might be acceptable. Please write down your comments in terms of flavour and taste. Which margarine you like more? Is it worth switching your regualr butter/margarine for? I must say – I was quite surprised and impressed with this product. Most people could not tell the difference between Becel Original and Becel pro-activ. (Inside tip: Becel original does spread a little thicker but only marginally). I was quite surprised that they tasted and felt so similar considering that Becel pro-activ has less than half the calories of Becel original (30 kcal vs. 70 kcal). So, from a test perspective it seems like using Becel pro-activ isn’t such a bad thing for the added health benefits. However, Becel pro-activ is significantly more expensive than other Becels and it comes in a smaller container. If you were to do a gram per gram comparison, Becel pro-activ comes out to almost three and a half times more expensive as regular Becel margarine. Also, in order to have the recommended dose of plant sterols for heart health benefits (2.0g/day) you will need to consume 5 tsp of Becel pro-activ each day. Needless to say, a tub will not last long at that rate. People who want the health benefits from plant sterols might be better off choosing foods such as okra, legumes, nuts and seeds that have plant sterols and the added benefit of other nutrients and fibre versus paying so much for a margarine. However, if people don’t have a tendency to eat or enjoy these foods on a regular basis, Becel pro-activ might be a good option to get regular plant sterols in your diet or supplement the rest of your diet (if you can afford it). Keep in mind, that the health benefit of plant sterols is really targeted to people who need to watch their cholesterol levels. « Peanut butter versus sunflower butter: Can you tell the difference? » Plant sterols: How do they work? I couldn’t tell the difference between Regular Bacel and the Plant Sterol Bacel. I was bamboozled! Can’t tell the difference between the two. They both tasted salty to me…but I think that was because of the cracker. Too be honest, I have no idea. They taste that same. However, to be fair, I hardly ever eat margarine so I’m no margarine aficionado (though who is?). I’m curious to see what others think. I’d choose either/or – they pretty much taste the same to me. “A” might have tasted a bit saltier but I don’t know if that was just the cracker either. I think A is Becel Pro-active and B is Becel Original. B taste better. A is the Pro-activ and B is the regular becel. A is more “thick” than B (meaning the color is more solid). Taste almost the same but i prefer texture B. A: pro-active (plant sterol) – opaque and looks much different from typical Becel. taste is comparable but less salter than B. not watery or bland like Becel reduced-calorie and light versions. B: original – looks like typical translucent Becel. saltier taste. Again, I had one of my coworkers re-label the samples so I wouldn’t know which one was which. 1. Spreads a little more thin, good texture and mouthfeel. I think this one is proactiv. I like this one slightly more because it’s not as salty. 2. Spreads a little more evenly, also good texture, tastes almost exactly the same but is slightly saltier. I think this one is Becel original. I have to admit, that I could kinda tell them apart from the way it was spread (Becel original goes on a bit smoother because of the lower moisture content). I wouldn’t mind choosing Becel pro-activ over Becel original if they were more comparable in price.